There are several car battery starters from different manufacturers and it may be difficult to make a choice when you need one. 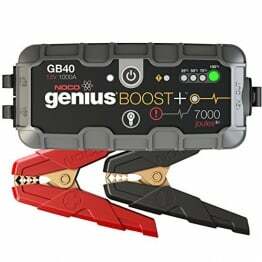 However, one product currently stands out and that is the NOCO GB40 UltraSafe lithium jump starter which is a portable but powerful device that can deliver up to 7,000 joules to dead batteries. It works efficiently for diesel (up to 3.0 L )and gas-powered engines (up to 6.0 L), which includes boats, cars, and even lawnmower engines. Currently featured on our list of best jumpstarters it is a great choice for the majority of drivers and car owners. There are a number of things that make the GB40 jump starter a great choice for anyone looking for the perfect car battery starter. Power for power, this lithium jump starter outperforms traditional chunky lead-acid battery booster packs at a fraction of the size and weight. With the following dimensions: 6.6in (16.7cm) X 3.2in (8.03cm) X 1.7in(4.34cm) and 2.69lbs of weight it conveniently fits in a glove compartment, center console, trunk, or toolbox. This may be a classic case of the saying “don’t judge a book by its cover”; this device appears small but it delivers up to 1000 Amps (7,000 J3S) which is approximately 20 jump starts when fully charged. It is also very easy and safe to use because it is equipped with a spark-proof technology that ensures that you can connect your battery to it in the right way and without any worries. Even if, for whatever reason, you happen to connect it incorrectly, the smart electronics inside will be able to detect it and warn you because there are detailed status indicators installed on the device. GB40 can be recharged using a USB cable or 12V car charger and every single charge is expected to have enough power for 20 starts. The built in 2.1A USB out port can power all of your USB devices such as your smartphones, watches, portable Bluetooth speakers, headphones, and tablets. In addition, NOCOGB40 also has a 100-lumen dual super bright LED flashlight that is very useful during emergencies especially because of the strobe lights. The double led flashlight has a switch which doubles as the switch for its 7 modes settings including SOS and Emergency Strobe. With multiple luminosity settings, it is immediately adaptable to a variety of situations. Using it’s powerful wash light will help you see your engine, help you change a tire at night, or even warn oncoming traffic when you are in need of roadside assistance. 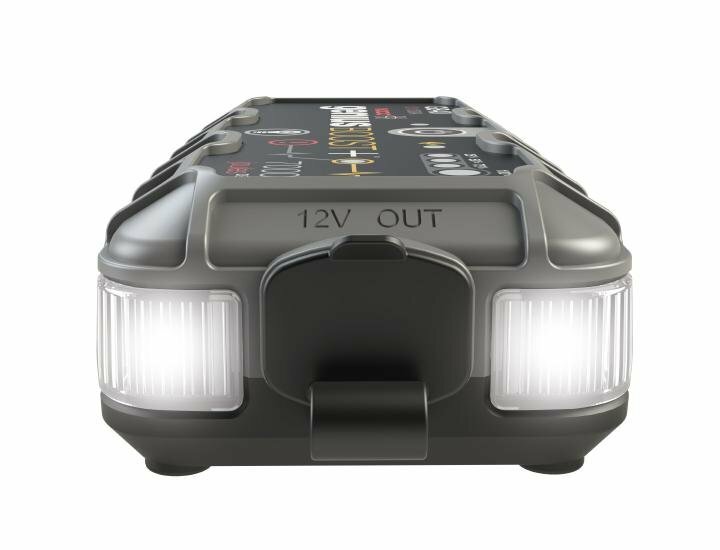 Talk about great things coming in little packages; the NOCO GB40 UltraSafe lithium jump starter is designed to be used for 12volt lead batteries and for 3liters diesel and 6 liters gas engines. The packaging is also great and it looks durable. It packs a punch. With a single charge, the GB40 can jumpstart up to 20 cars providing they are using 12volt lead-acid batteries. It also works well with diesel engines despite its small size. Easy to use and safe. The device has an in-built reverse polarity and spark-proof technology which ensures that it can be used without any worries. Its cables are also flexible and well-built thus preventing overheating or melting. It also has a display and an installed system to detect connection errors and any problems with the device before use. Compact and handy. It is very small and lightweight which means you can put it in your car and never have to worry about being stranded in an emergency. The NOCO GB40 UltraSafe lithium jump starter can also be used to charge mobile devices. The flashlight feature can also be used at night and it also has the strobe lights for emergencies. Limited number and capacity of ports. Unlike other jump starters that have different voltage ports, all the ports on this device are 5-volt ports. This may limit its adaptability when you have USB cords with other voltage parameters. Its use is restricted to 12-volt lead-acid batteries only, up to 6 liters gas engines and 3 liters diesel engines. It cannot be used with some engines that require a lot of current to jump start the battery such as a V8 engine and other high power engines. This device is, without doubt, an important tool that every car owner should have in the trunk or the glove box. It comes at a highly competitive price and has amazing features to boot. It has many uses and adaptations which means you will definitely get great value for your money spent. Additionally, the manufacturers paid close attention to the functionality and appearance of the device, and they succeeded in creating a device that is not just aesthetically appealing but one that also performs incredibly well. If you are in need of a jump starter that can serve you efficiently and is durable, then the NOCO GB40 UltraSafe lithium jump starter is perfect for you. 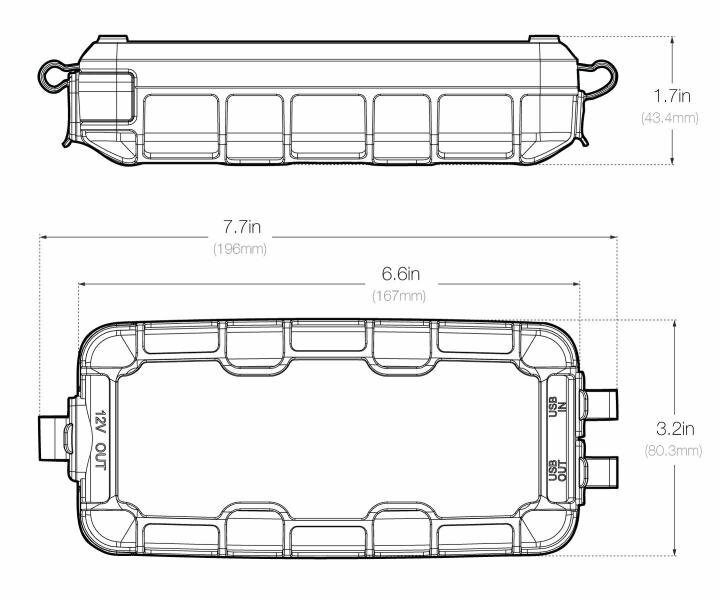 It can be used for a variety of equipment and engines which include car engines, truck engines, snowmobiles, UTV’s, ATV’s, campers and several others. It is reliable and you can rest assured that you would be making a wise decision by purchasing the NOCO GB40 UltraSafe lithium jump starter.